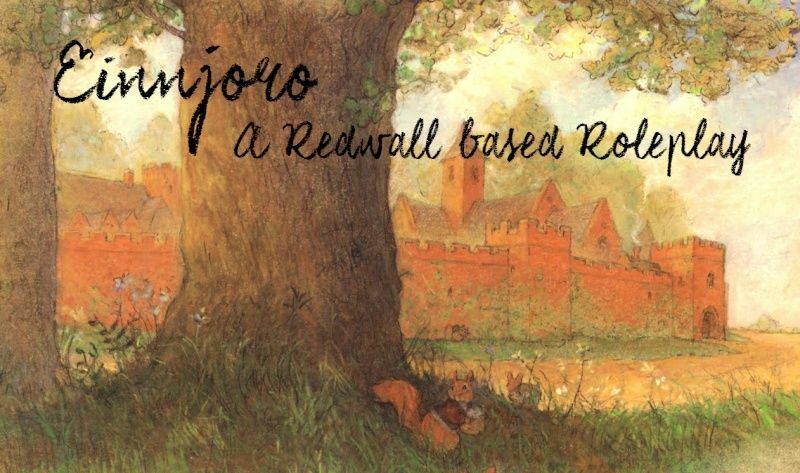 Einnjoro is a Redwall based Role Playing Forum. Come discover a whole new world! Adventure, exploration, fighting, music, and much more await you at Einnjoro! Einnjoro is a brand new RP website that is now open for applications. It is loosely based on the Redwall books written by Brian Jacques. Einnjoro is set in a Medieval time period. The characters which you may play as are animals. Some of the currently accepted species are otters, moles, raccoons, mink, pika, squirrels, and many more! Come grow with Einnjoro! As we grow, the known world will expand to fit the storylines and everything. More animal species will be accepted for you to RP as the known world expands to encompass a larger area. Einnjoro is an intermediate to advanced roleplay, that is, you are expected to use good grammar, write in the same tense, be able to write in a fluent manner, and write a good amount, no one liners here. The recommended age for you to join is fifteen or over. Concepts and other parts of the site may not be understood by younger ages. If you are under fifteen, we won't prevent you from joining, but the site is geared towards an older age group. We do have a library of information to help you improve your RPing experience, and weekly (optional, you don't have to) character building exercises to help you better know your character and practice your writing. So you'd like to join us? Great! Simply make an account and head over to the forums to fill out our application form! Leaders of Tribes, Holts, Etc. This post is under construction currently, but I wanted to bring it to everyone's attention as it is fairly important. Some things in it are going to be edited, so we will post an update as an announcement when it is completely finished. Please make sure you read it then, even if you read it now. Hurrah! I finally got the new chatbox up and running! I hope you guys like it! I'm still in the process of moving it above the "Who is online?" portion of the main forum page, but the chatbox is usable! » Needed alts or npcs? » Water daisies and pond crickets. How did you find out about Einnjoro?